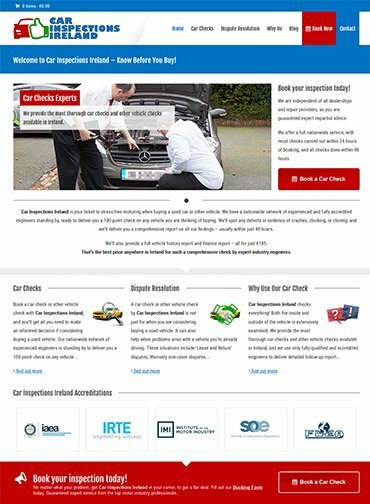 Car Inspections Ireland based in Tallaght in Dublin is a new venture in providing peace of mind for the ordinary motorist – primarily for when about to buy a used vehicle, but also if issues arise with a vehicle already purchased. They are unique in that they will send an accredited automotive engineer to anywhere in Ireland to conduct a thorough vehicle inspection and produce a comprehensive report, all for the same flat fee. In the case of pre-purchase inspections, a vehicle history report and finance report is also included, to provide further peace of mind or else to identify other potential problems. They wanted a website to portray all aspects of their business, and to rank highly so it will be found by the thousands of people who buy a used vehicle each month – and so they came to us. We first performed keyword research and other analysis, and were blown away by the sheer size of the relevant marketplace. We advised our clients of the great opportunity they had, but also that it would be crucial to get the content and marketing messages right. We developed an action plan and project charter in consultation with the clients, all the while keeping the focus on the information the average user would be seeking. We also agreed upon the booking system and payment gateway that would be used. Simplicity was key to this project. The average buyer who would be seeking a vehicle inspection would most likely have little or no automotive knowledge themselves, and so the challenge instead was to convince them of Car Inspection Ireland’s merits and expertise, without boring them with high-level technical content. Our copywriter therefore produced powerful yet succinct text content, highlighting the great level of service provided and the unbeatable all-in price. Our web design and development team produced a lean website design that funnels all user activity towards clear Calls To Action, and ensured that all key messages in the content stand out clearly. All pages, images, tags, etc., benefitted from full SEO attention too, to ensure we would meet our client’s other target of seeing the site rank highly for targeted search terms.